Hey everyone just wishing to let everyone know of our next meet at the HORCC track at Peachester, Queensland. It is going to be the weekend of 31 of March/1 of April. Everyone is welcome not just the mighty Baja's. We should have at least 5 Baja's with the possibly of up to 8 if everyone we have spoken to turns up. What a MEET to have! This our monthly meet held at the track. Camping is welcome for anyone interested! We now have a formal race for the Baja class with trophies. This is only for the people looking for a formal race the cost is just $5au to cover the trophies. But if you only after some fun thats totally cool too. We are all about enjoying our hobby. BYO grog as where else can you drink and drive! R/C cars that is!!! Once again we would like to extend a warm welcome to anyone interested in a great weekend. For further details contact me. 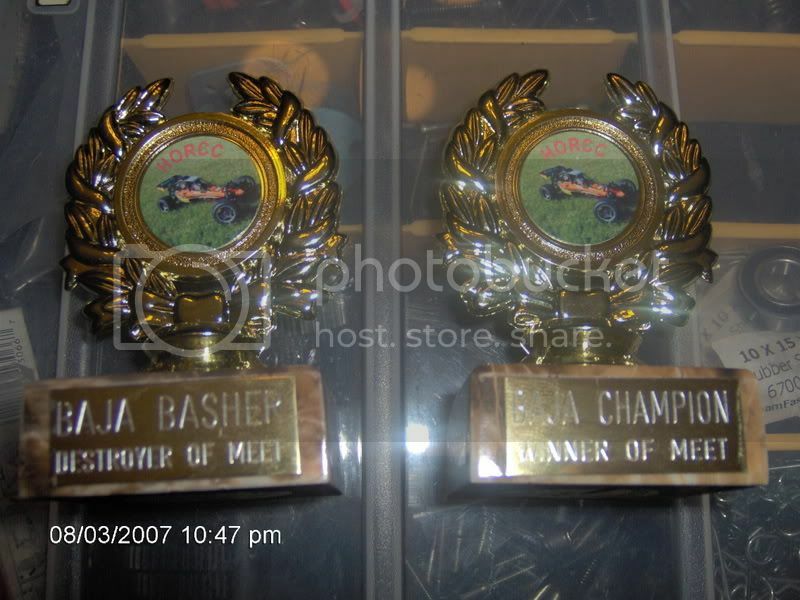 Just as a teaser here is the pic of the trophies. Gee if I hop on a plane today could I get down there in time? I do not hink I would be sober enough to drive the Baja, with drinking all the fosters and Australia wine I could get my hands on. Yes you could easy make it in time. When we camp there for the night it is always interesting with the drinks flowing freely and some night racing with the r/c cars. Lol. We know how to have a GREAT time!! !